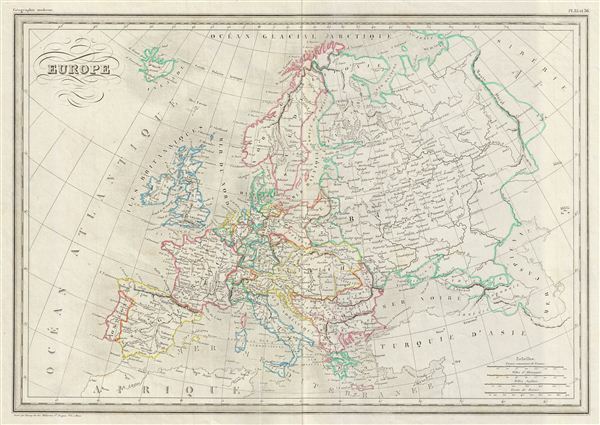 This is a fine example of Conrad Malte-Brun's 1843 map of europe. The map covers the entire continent from the Atlantic Ocean to the Ural Mountains and from the Arctic Ocean to northern Africa and Turkey. It includes Spain, Portugal, France, Italy, european Russia, Sweden, Denmark, Norway, Germany, Ireland, Great Britain, and Turkey in europe, Greece and Iceland. Issued following the defeat of Napoleonic France and the Congress of Vienna, europe is shown under a new peaceful balance of power, centered on the five most important powers (also referred to as the five 'Great Powers'): the United Kingdom, France, Russia, Prussia and the Austrian empire. Alas, the 'peace' was but an illusion as the treaties ending the Napoleonic era were inherently flawed. Old rivalries festered and nationalism, liberalism, revolution (industrial and otherwise) was once again on the rise throughout europe. Various cities, countries, towns, islands, rivers, lakes and various other topographical details are marked, with relief shown by hachures. Boundaries are color coded according to countries and regions. This map was issued as plate nos. 35 and 36 in Conrad Malte-Brun's 1843 Precis de la Geographie Universelle. Very good. Original centerfold visible. Blank on verso.